The group have brought in Nigel Godrich (Radiohead, Beck) to handle mixing duties for their 11th album after teaming up with producer Danger Mouse on the recording. Frontman Anthony Kiedis praised Danger Mouse’s work on the project last October in an interview with Rolling Stone, saying "He's very good about coming up with super-modern ideas, but he'll also touch on the acoustic guitar in the control room and strip the song down to its acoustic essentials. Which is a beautiful place to be." Sessions for the group’s first full record in five years were put on hold for six months last year after bassist Flea suffered a broken arm during a skiing trip in February 2015, which actually gave the band time to write more material for the project. 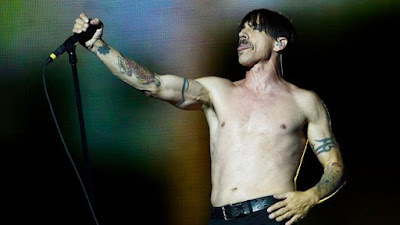 “We've been writing new music for the last year,” said Kiedis last fall, “and we’ve written some songs that I feel are as good as any songs we’ve ever written." While no timetable or further details on the record have been revealed, the Red Hot Chili Peppers will return to live action next month with an appearance at the New Orleans Jazz & Heritage Festival on April 24, followed by May shows at Ohio's Rock On The Range and California's BottleRock, and a series of dates on the European summer festival circuit starting in June.